A Security policy template enables safeguarding information belonging to the organization by forming security policies. In any organization, a variety of security issues can arise which may be due to improper information sharing, data transfer, damage to the property or assets, breaching of network security, etc. With the increase in the use of varieties of devices and threats, forming a foolproof security policy is unavoidable. 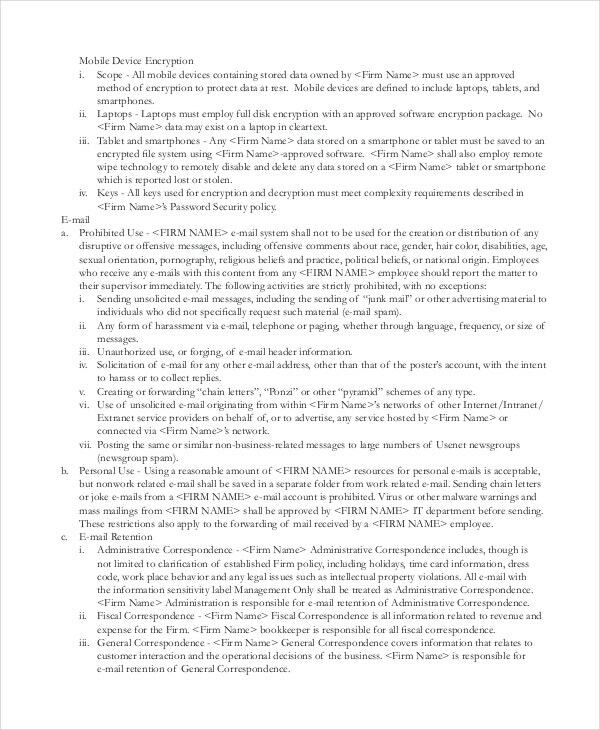 To mitigate the security risks, companies outline security policies and one can utilize these security Policy Templates effectively. One can find more information about them by searching Google using organizational security policy template or IT security policies and procedures examples. 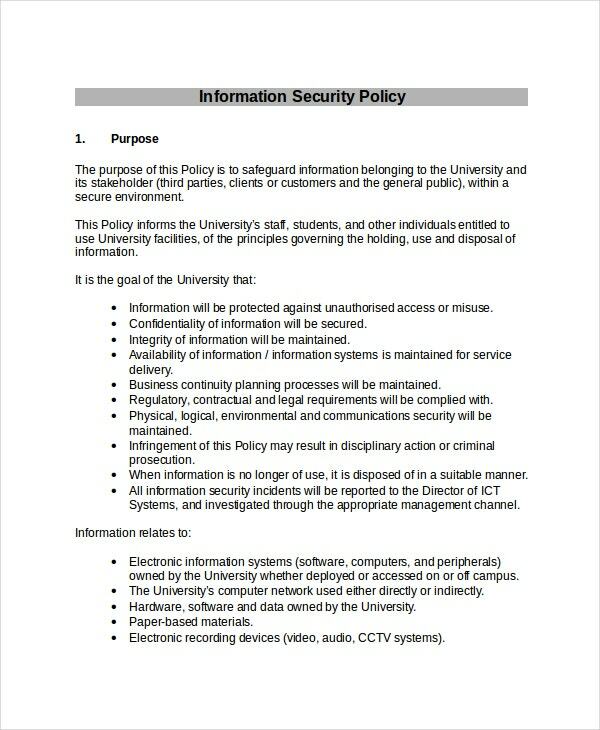 This information security Policy Template provides policies to protect information belonging to the university and its stakeholders. It derives policies to the staff and other persons who use the university facilities and the methods about safeguarding the information. 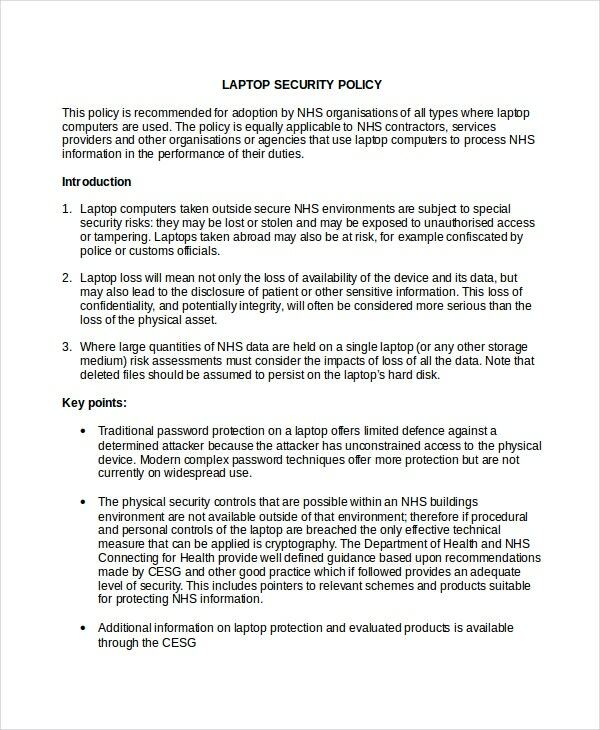 This data security policy template provides policies about protecting information when using various elements like computers and servers, data backup, password security, usage of internet, email usage, accessing information through remote access, using mobile devices, etc. 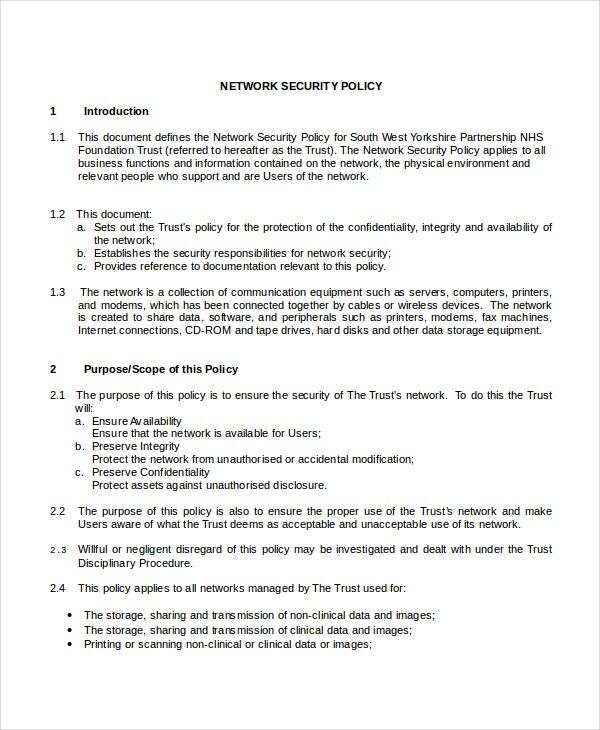 This network security policy template provides policies for protecting confidentiality, integrity as well as accessibility of the network. It also institutes security accountability for network security. It describes risk assessment of various network security elements. This physical security policy template provides policies to protect resources from any kind of accidental damages. It enables to identify and record security risks. It provides the implementation of safeguarding from risks at a reduced cost. 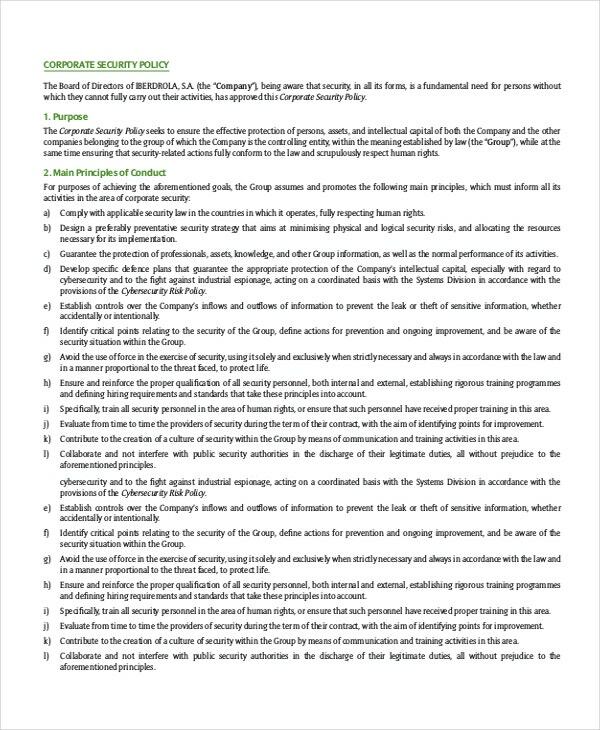 This corporate security policy template seeks to make sure that efficient safeguarding of persons, assets and company capital. 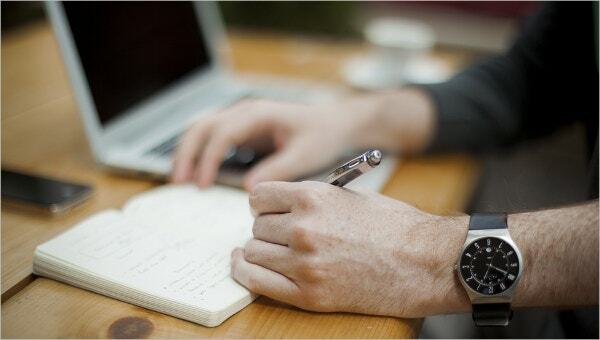 It also provides to design preventive security strategies that protect knowledge, professionals and information. > How does a Security Policy Benefit an Organization? The benefits of security policy for any organization are abundant. They protect the company information privacy and safeguard the information from getting leaked to the competitors. They enable to restrict the employees from taking pictures using mobile devices. They also restrict accessing company information through network by limiting the access. Similarly, sending information through email or taking data backup in personal devices are restricted. They help to protect assets from any damages and protect the staff from any physical threats. They also formulate policies with regards to digital signatures, password protection, server security, equipment security, laboratory security, web application security and many more. > What does a Security Policy Contain? 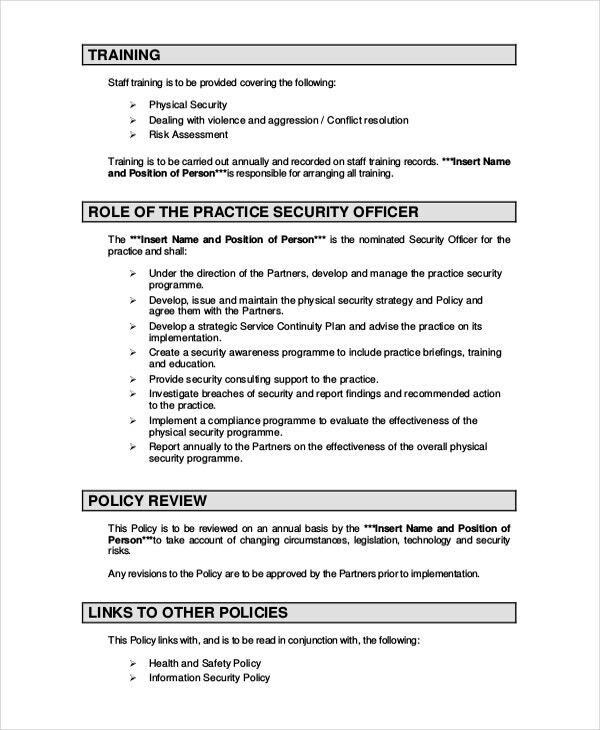 A Security Policy Template contains a set of policies that are aimed at protecting the interests of the company. They safeguard hardware, software, network, devices, equipment and various other assets that belong to the company. They also enable to record breach of security and help to mitigate them from further occurrences. They provide policies to decide on the ownership for data, providing access to company employees and many other controlling measures. They also enable to protect the organization legally from any sort of threats. They provide risk assessment and enable to draft security policies effectively. They help the employees to follow ethics at workplaces and adhere to the company policies. > What is the Importance of a Security Policy? It describes how to store, share and transmit information safely and securely. It provides policies regarding usage of various devices like printers, fax machines, scanning machines, mobile phones by the staff at the workplaces. It drafts policies for using network, wireless network and exchange of data between various parties. It enables drafting policies for restricting unauthorized usage of software and thereby prevents malware threat. It also provides policies for security monitoring and provides authority to block the devices to control security breaches. It enables implementing cost-effective policies to protect security of the company by safeguarding information, integrity and confidentiality. The Security policy template is extensively utilized by varieties of organizations to protect their interests including their assets and resources. They are also called quality policy of the company which helps in drafting various quality rules and regulations. They come with tons of varieties and one can utilize them effectively and create security policies to safeguard the company.